Near the end of June for approximately one week. If you are looking to store pie cherries for awhile before using them, or if you are going to resell them, pick them with the stems. Store pie cherries in the refrigerator until you are ready to use them. It is best to use them right away, but they will keep up to four days in the refrigerator. Pie cherries can also be frozen. Wash them, dry them, remove the pits, and store in freezer containers. 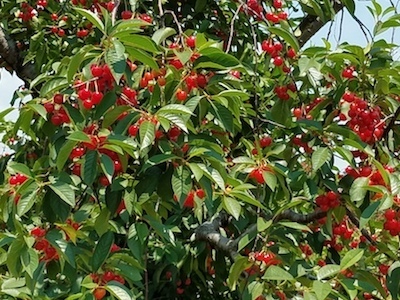 Tart cherries are a good source of dietary fiber, vitamin A, and antioxidants. 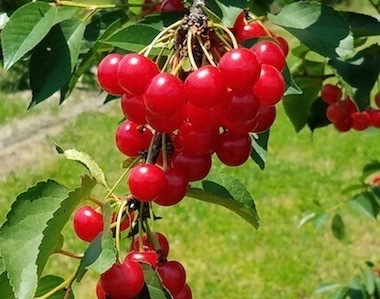 Tart cherries are used to treat arthritis and gout. Tart cherry juice concentrate is for sale at the market from cherry season until closing.